February is Aviation Month at the Governors Island Explorer’s Guide. With the centennial of American entry into World War I coming up in April, we will begin the second annual Aviation Month with the story of a pilot who practiced flying on Governors Island and was killed by German bullets in 1918. His story is one of sacrifice to the nation. Today his name is among the group of fifteen carved on the island’s bronze aviation pioneer monument, along with Wilbur Wright and Glenn Curtiss. Raynal Cawthorne Bolling was an incredibly wealthy corporate lawyer who could have sat the war out at his brand-new mansion in Greenwich, Connecticut. Called Greyledge it had thirteen fireplaces and a shooting gallery. He was a successful New York City lawyer with a young family. But what sets Bolling apart from others of his generation is that he put everything in his life behind when America entered the war. He was born September 1, 1877, in Hot Springs, Arkansas. Bolling was educated at private boarding schools, going on to graduate from Harvard in 1900 and Harvard Law in 1902. He went into the steel industry in the law department; at U.S. Steel he rose to solicitor general. In 1907, Bolling married Anna Tucker Phillips in Beverly, Massachusetts. They had four daughters and a son. In 1916 he moved his family into Greyledge, which was designed by Carrère & Hastings, architects of the New York Public Library. Bolling spent virtually no time enjoying his family and new home. When fellow Ivy League men formed the Business Men’s Training Camp at Plattsburg, New York, Bolling was among the first to go. He attended the grueling summer course in 1915. General Leonard Wood on Governors Island supported the camps. It’s estimated ninety percent of the camp attendees were commissioned officers in the war. He took private flying lessons and learned to become a pilot in the early days of aviation. Civilian businessmen were forming private flying clubs. Bolling was among those that trained at Fort Jay between 1916-1917. The pilots would take short hops from Governors Island to the airfields that were opened in Long Island around Garden City. Bolling and his fellow pilots formed the first aviation National Guard unit, a forerunner of the Air National Guard, the 1st Aero Company. 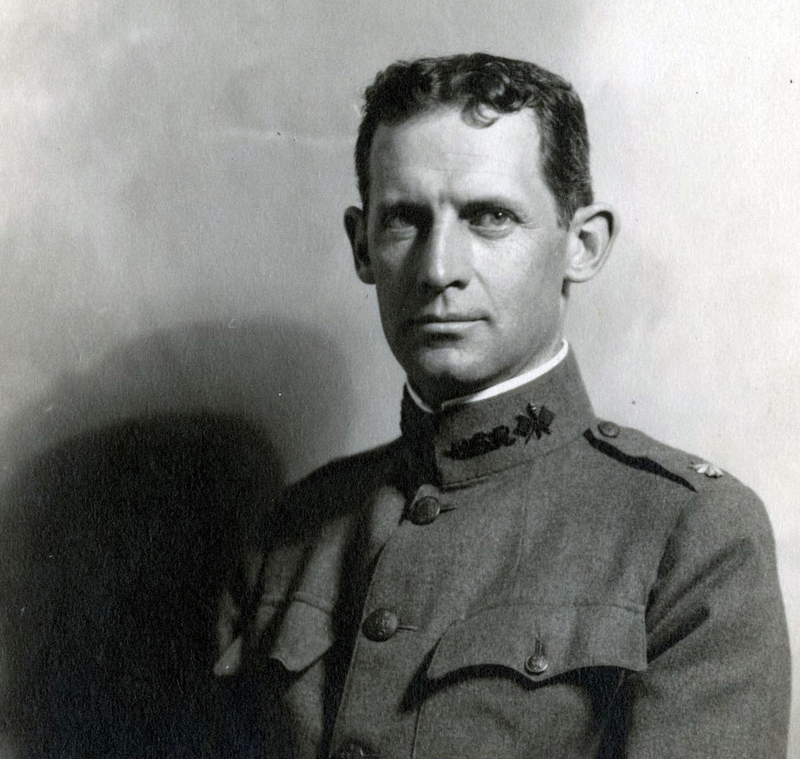 With war brewing the U.S. Army made it a federal company in 1916; Bolling was made commander in the Signal Corps unit. The Army saw his leadership potential and commissioned him in the air service. He was quickly promoted to colonel on August 8, 1917. He was sent to France to join the A.E.F. leadership and head up procurement of airplanes for the U.S. forces. With his background in the steel industry, Colonel Bolling was a perfect match for helping the new Army aviators get the planes, supplies, and training needed for the war. When more American forces arrived in the spring of 1918, Colonel Bolling sought and was given a combat command. He was named to lead the air service for U.S. II Corps. On March 29, 1918, Bolling took a car and driver, Private Paul L. Holder, 22nd Aero Squadron, on a scouting expedition. The pair was alone on the Amiens-Saint-Quentin Road when they were caught between the fast moving lines around Amiens. German machine gun crews ambushed them. Colonel Bolling was shot twice while protecting the unarmed Private Holder. He was 40 years old and became the first high-ranking American officer to die in the war. His remains were never identified. Colonel Bolling is among the 333 names of those missing in action listed at the Somme American Cemetery and Memorial on the Tablets of the Missing. There are 1,844 Americans interred here. Colonel Bolling posthumously received the U.S. Army Distinguished Service Medal, the French Legion d’Honneur, and Croix de Guerre. 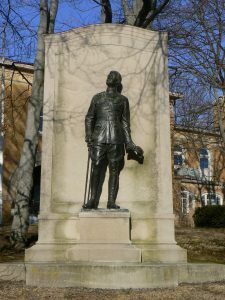 There is moving sculpture of Colonel Bolling in Greenwich, nearby the town World War I memorial. The aviator is standing as if on an airfield, looking to the skies. The sculptor, Edward Clark Potter, was also from Greenwich. Potter created the pair of marble lions who grace the New York Public Library. Bolling Air Force Base (known today as Joint Base Anacostia-Bolling) in Washington, D.C., was named for him. In 1954 the Early Birds monument was dedicated at Fort Jay and Colonel Bolling’s name is engraved on it. Today a collector owns Colonel Bolling’s uniform. In 2007 hedge-fund manager Spencer Lampert spent $7.6 million to buy Greyledge and raze it. For more history stories, pick up The Governors Island Explorer’s Guide (Globe Pequot Press).